Actually, it will. The code allows SiteWit to do a lot of really cools things that can help you save money and increase revenue much more quickly. With the code installed, SiteWit can see how the visitor behaved on your site, whether or not they accomplished any goals (purchase, form submission, etc..) enabling you to see which ads are really driving traffic and sales to your site. SiteWit then uses this data to predict what other visitors will do. Additionally, it can tie a visitor across multiple visits to your site and this information is invaluable. Lets look at a realistic scenario. Lets say you sell shoes online. A visitor searches for shoes in their favorite search engine, sees your ad and clicks on it. They browse your site for a while and decide to come back later and buy some shoes. Later they come back on your site by clicking on a different ad than the one they originally clicked on their first visit. Now they purchase six pairs of shoes. Congratulations you have made a sale, but where did the sale come from? Well that is tough to say. If you do not have any analytics for your site, you will probably never find out, so you can’t really make an informed adjustment. If you do not have a tracking code installed in your site, you will never what made your customer buy 6 pairs of shoes on that visit. Now you are armed with the data to make an informed decision because you have an accurate and timely assessment of the performance of all your ads and keywords. But wait, it gets better. 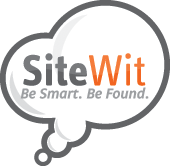 SiteWit has pro-actively already analyzed this for you! Based on these key indicators, your Specialist will have taken the corrective actions necessary to the text of your ads, or to the keywords not producing the desired results over time. So the time you took to install the SiteWit code is really paying off in a big way.